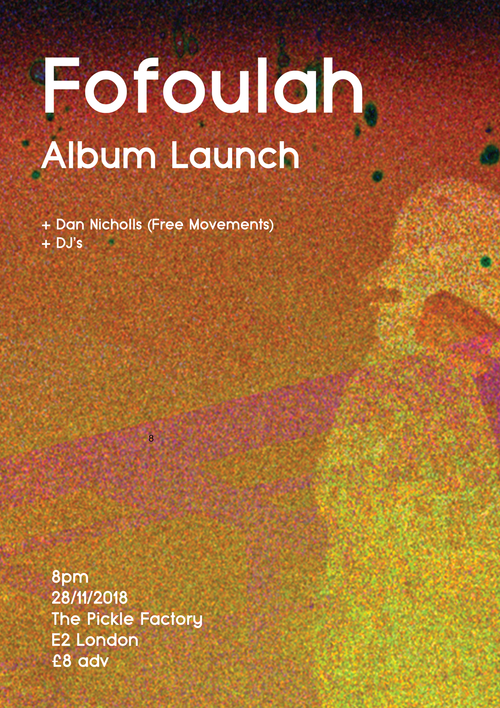 London based afro-dub ensemble Fofoulah appear here at Pickle Factory to launch their second full length album - 'Daega Rek', following up their trailblazing debut album (“Fofoulah” - Glitterbeat 2014) with an even more shapeshifting and adventurous sound. Slippery Sabar beats, dystopian electronics and echoing, group rituals ratchet up both the dub quotient and the dramatic tension. Creating a soundworld that is both futurist and rooted - the new album “Daega Rek” is brought into sharp focus by the rhythms and vocals of Gambian sabar drummer Kaw Secka. Batch Gueye brings vocals, drumming and dance to the live show alongside Dave Smith (Drums), Johnny Brierley (Bass), Tom Challenger (Synths, Saxophone) and Phil Stevenson (Guitar). Supporting will be Dan Nicholls (Free Movements) performing a live set.